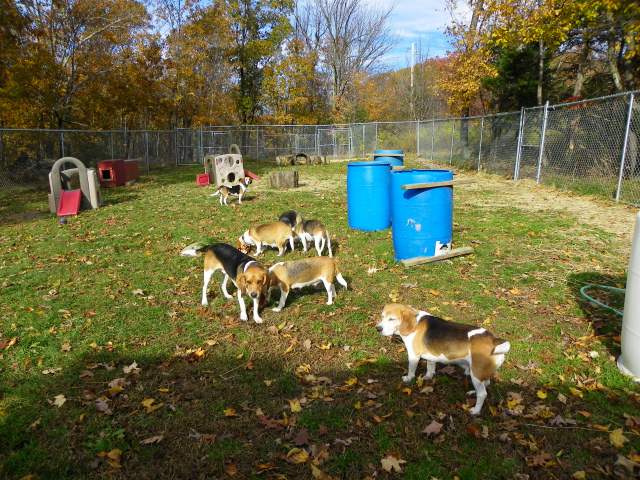 The New Jersey Beagles kennel sits on an acre of land surrounded by 6 more acres of wooded property and our home. 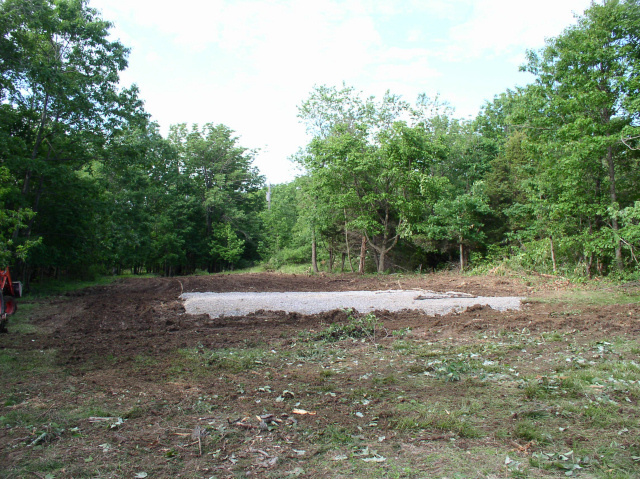 What most people don't know is, before our kennel was built, the property it now sits on was carved out of a totally wooded area. What you're looking at now was excavated and built in ONE week, with most of it done in just one weekend. 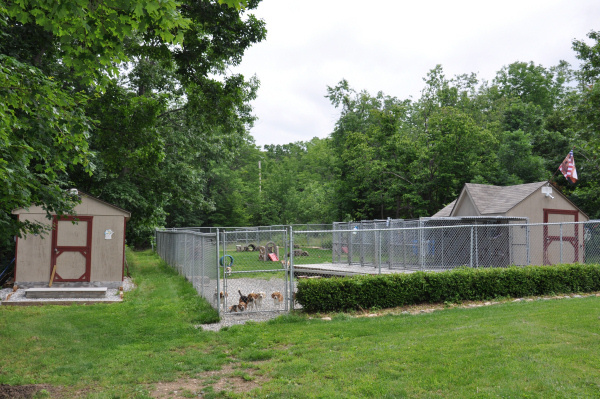 Our show dogs, along with the rest of our beagle family live in the heated and air conditioned building on the right, complete with running water. Their houses are inside the building where they can come in and out as they please. The kennel dog houses have doors that swing both ways, so they always close behind a dog coming and going, which helps to conserve the heat and air conditioning in the insulated building. 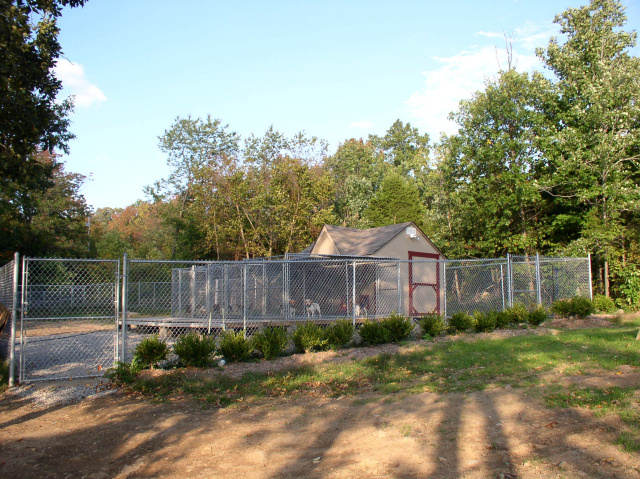 The big kennel yard (60'x140') is used daily for exercising the dogs. On nice days they will spend up to 7 hours in the yard. There they have the freedom to run, play, or just relax in the sun. The building on the left is our puppy nursery, complete with heat, air conditioning, refrigerator, microwave oven, and beagle puppy curtains hanging on the windows. 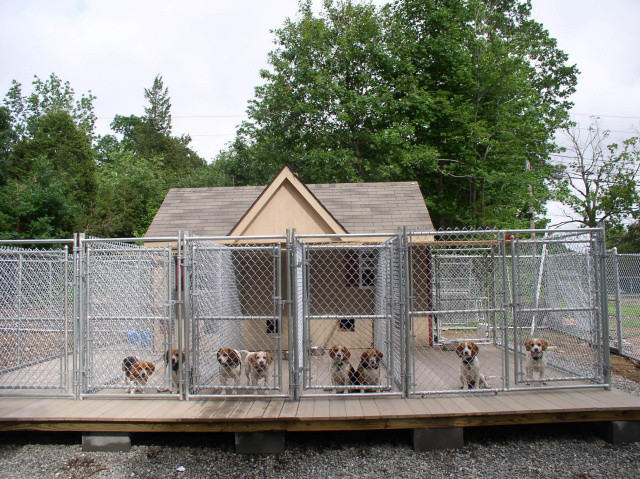 This is where our mommies will live with their puppies until the pups have been weaned and then ready to leave with their new families at 7 weeks old. There is a doggie door inside leading to a large fenced in yard where our mommies can go in and out for potty breaks or just to get away from the kids for awhile. The building is equipted with wireless cameras so I can watch over our puppies and their mommy from a 52" monitor from inside my house. I can also watch and make sure all puppies are thriving and nursing well, and keep track of the temperature in the kennel. We also have a computer and two web camera's in the building where we are able broadcast live on the internet daily so our puppy families can watch their new puppy as he/she grows and interacts with their littermates and mommy. Using the photos below, I've tried to take you on a little journey as we began the process of building, what I consider, one of the nicest, functional, kennels around. 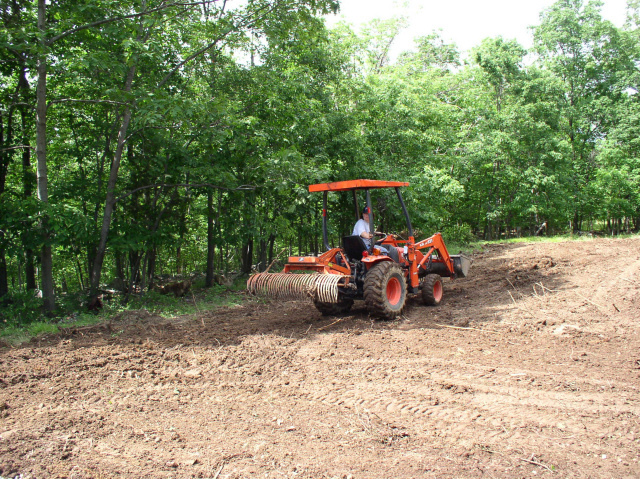 The kennel will be built on the wooded area straight back. 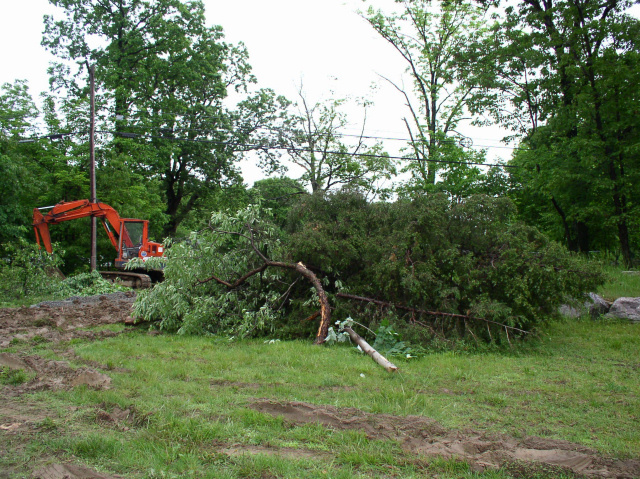 The cleared area is actually part of our front lawn. 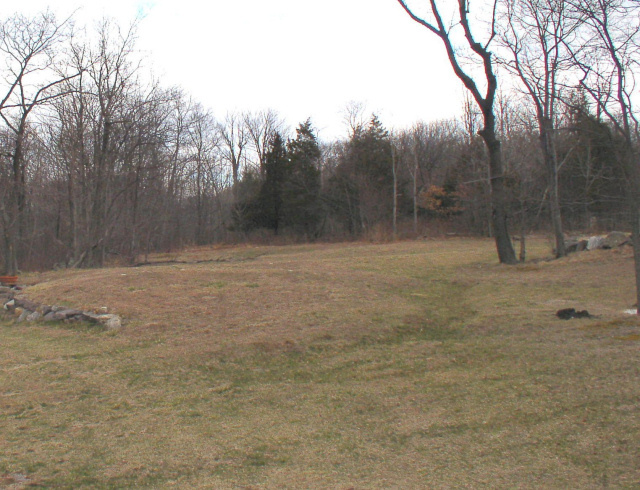 Time to rake and level what will soon be the kennel yard. 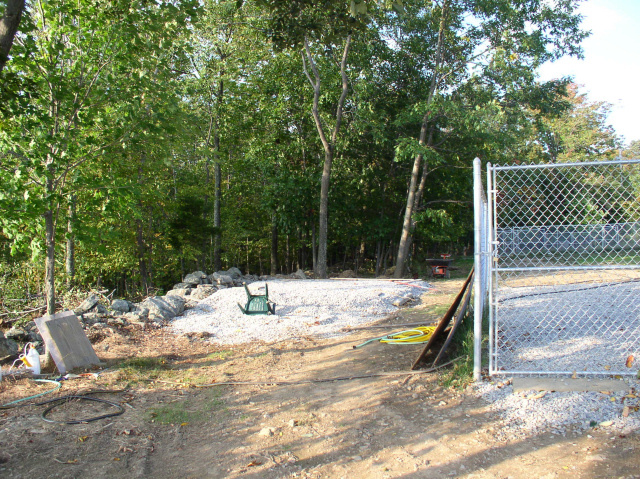 The kennel yard is level and the gravel has been laid down for our kennel pad. 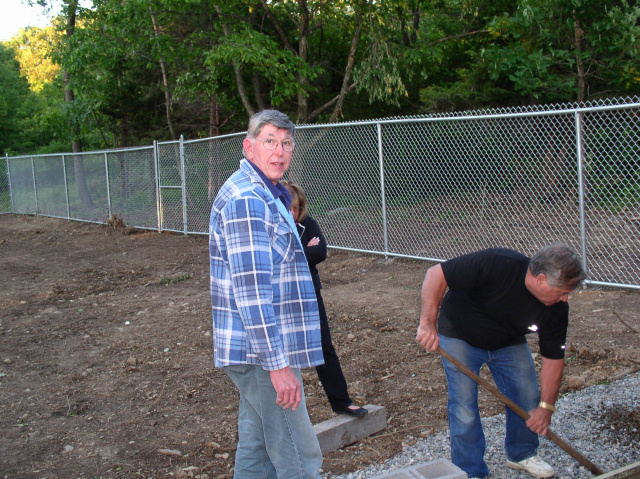 The six foot chain link fence surrounding the whole compound will be installed later. 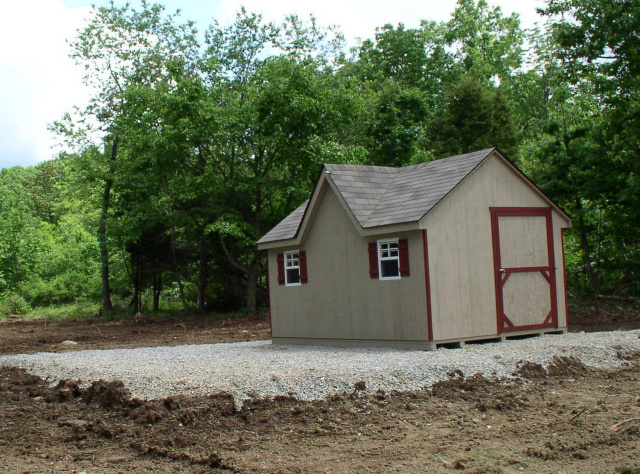 Our 8' x 14' Victorian style building that will house our beagles is delivered and placed on the kennel pad. Don't let the photo fool you... 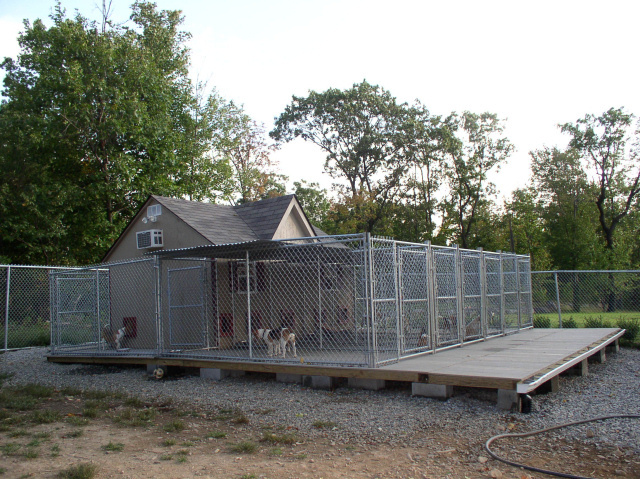 This is a nice size building and we utilize the front, side, and back for kennel housing, giving our hounds lots of living space. 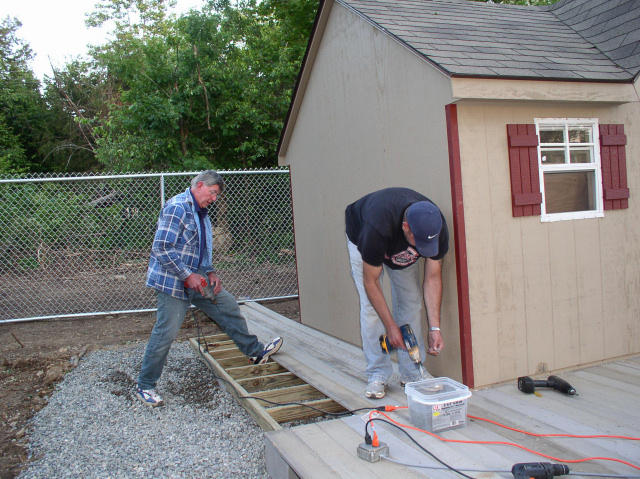 Building a frame and laying down our no maintenance decking for our outside kennel floor was a HUGE job. 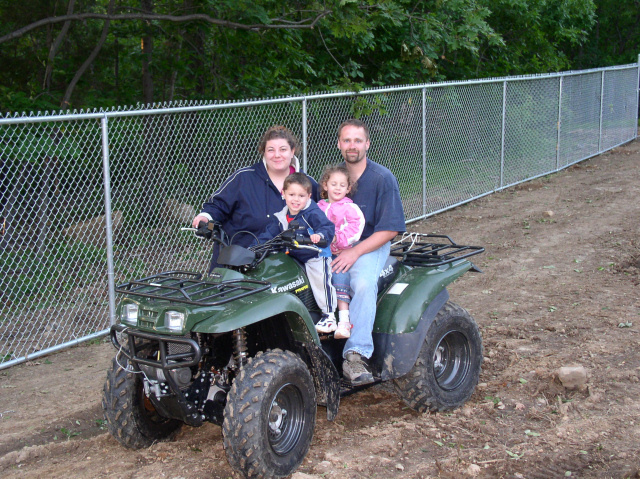 Julie and Steven, my grandchildren, were more than happy to help. All work and no play makes for very bored children. 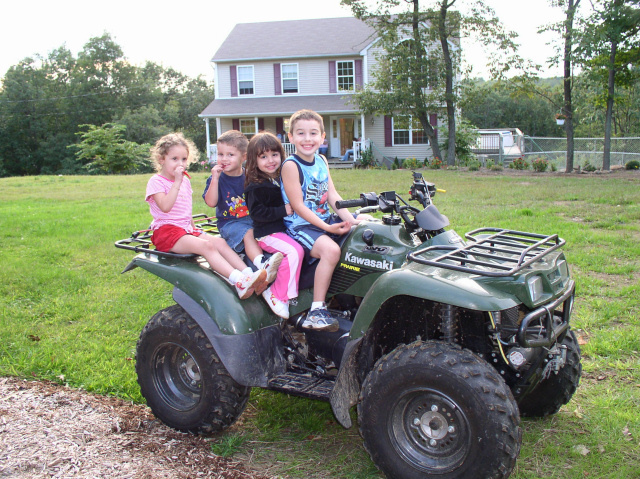 Besides, what fun is it going to Nana's house if you can't get a ride on the ATV? 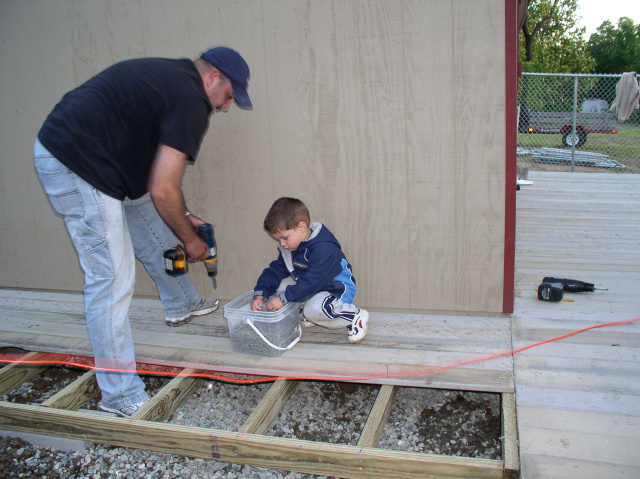 Our kennel fencing is now installed and last minute decking is laid down. Things are really starting to shape up. Soon the dogs will arrive at their new home. 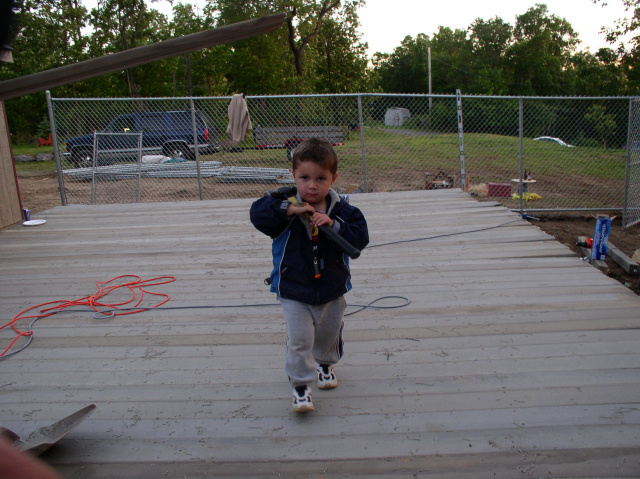 Three of my four children, and their spouses were on the job. 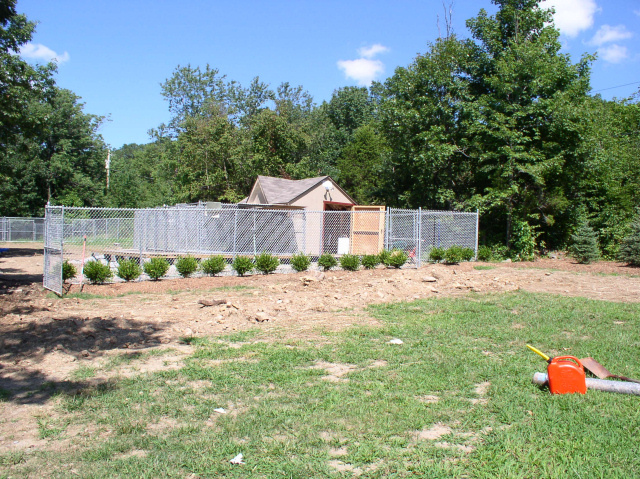 The kennel deck is complete and the kennel fencing is installed, along with a 6' high chain link fence surrounding the entire complex. 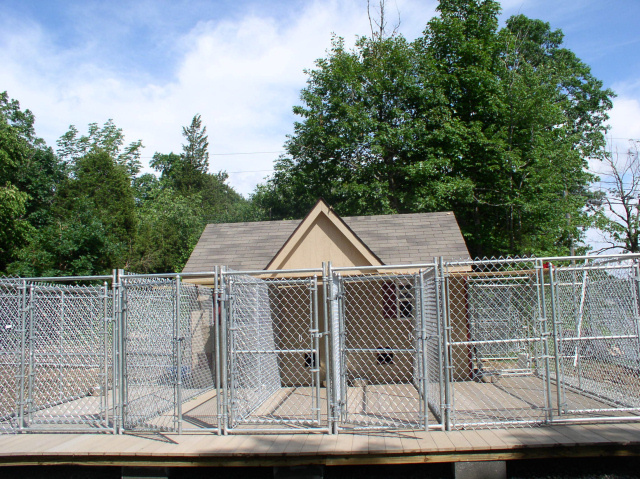 For the last week, the dogs have remained at our old house in their kennel until we competed the new kennel enough to move them over. 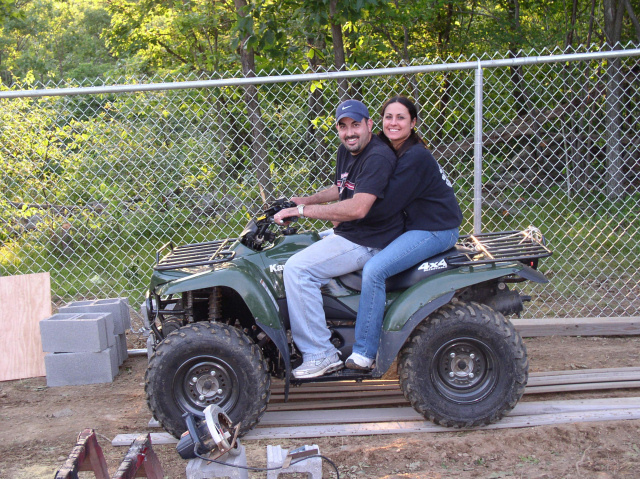 It's time to finally go get them and move them over to their new home. They are looking mighty happy and comfortable. A lot more room then the previous kennel they were in. At least they're here now. 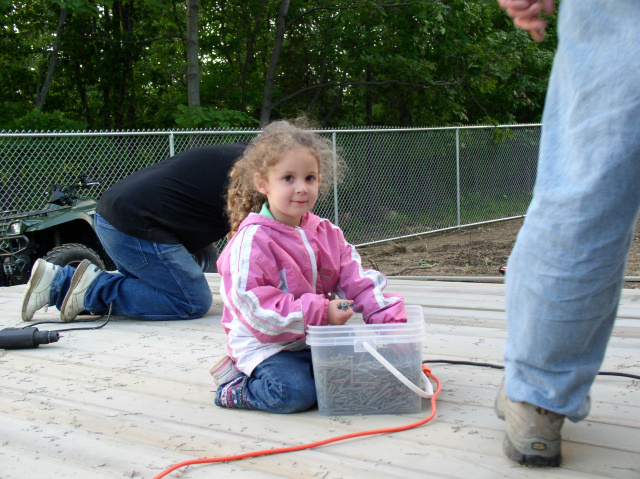 All the finishing touches can be done while they watch and relax in their new home. How it's starting to shape up. The last step now. 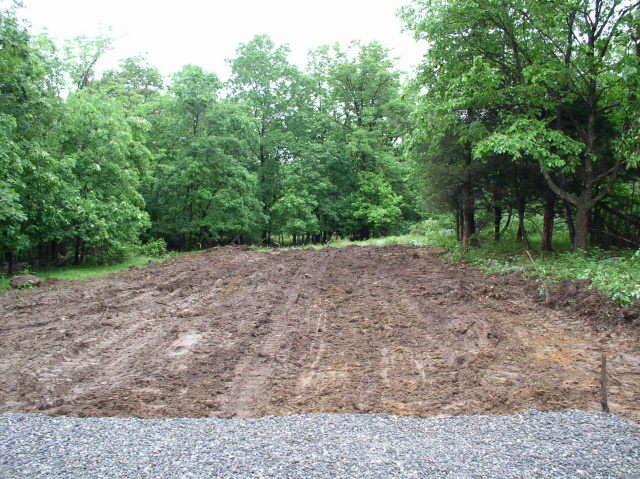 The pad is being leveled off for the arrival of another building which will be our puppy nursery. That's it.... We're all done! 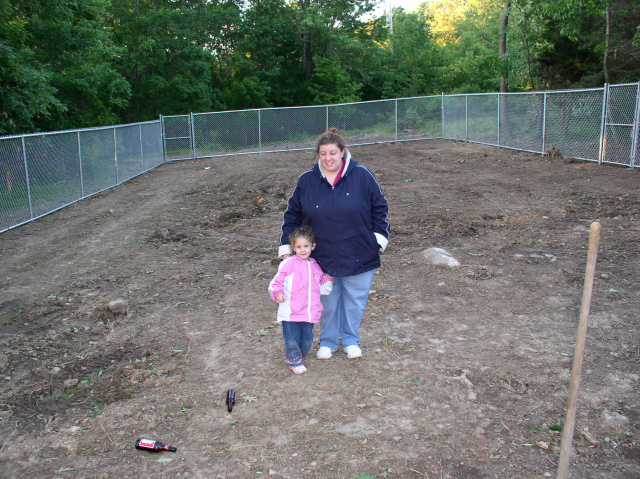 Remember, except for the grass, this entire complex was built in just one week.